Have you ever woken up by 6:25 a.m. on December 31 to register for an extremely challenging half marathon? If so, you probably know that this race recap is about the Cary Hillstriders’ race: the March Madness Half Marathon. This race was created 40 years ago by running group Cary Hillstriders as a way to raise money for their club funds while also giving back to the running community in the form of putting on a stellar race. For the past 10 years, the race has sold out in under an hour. Yes, over 1,000 people wake up bright and early on New Years Eve simply to sign up for a disgustingly hard half marathon. In fairness, many of these runners use the race as training for the Boston Marathon. But those who get suckered into signing up for the race without being able to preview the course are in for quite a surprise on race day. New this year: runners who thought that they might take more than two hours to finish the race had the option to start at 8:05am. A lead cyclist was provided for the early starters, though the course is marked very well. The first five miles of this course are most definitely the “easy” section despite having a few rollers mixed in. Shortly after mile five, “Shoe Tree Hill” begins the long stretch of hilly miles. Fortunately, this is an up-and-down hill and doesn’t really affect your pace too much. Once you’re almost halfway through the race, you encounter another challenging hill—an addition to the course in recent years. After grimacing your way up that hill, you are rewarded with a flat section for a good half mile, but usually the wind is in your face at this point in the race. For a few minutes, you are able to regain your strength as you physically and mentally prepare for yet another rough hill right after mile seven: Winding Hill. This hill is the one that gets me every time; yet, just like Shoe Tree Hill, this one goes back down quickly and doesn’t affect your pace too much. After flying down this hill, you likely see runners at a four-way stop sign – these runners are heading back to the finish line, with just under two miles to go. You, on the other hand, still have a few hills to tough out before earning that hot pretzel at the finish line. Mile eight to nine is one of the fastest miles on the course. It is probably the only flat section of the course, and the momentum from flying down the hill at mile seven seems to carry most people through this mile. And then, the hill at mile 10. This one isn’t very nice as you don’t get a downhill to follow your effort uphill. The good news? After you make it up, you hit a water stop and officially have only a 5k left to run. The bad news? The hill is a quarter-mile long. And to make things worse, “Sneaky Hill” is just around the corner. After passing the water stop, you weave through a neighborhood before climbing this deceivingly tough incline. But, like many hills prior, you are rewarded with a wonderful downhill that again causes your pace to falter slightly less than the previous hill. Two more shorter (but punchier) hills stand between you and the very well-earned finisher’s medal. One up-and-over short hill right before mile 11 comes and goes quickly, and before you know it, you’re seeing people fly down the 7-mile-hill, only this time, YOU are the one on the way to the finish line. One more punchy hill to climb before making your way into the neighborhood where you are eventually greeted by mile 12 and the final water stop. At this point, your legs and lungs are burning, but the volunteers are (mostly) right when they tell you that the hills are done. Out of the neighborhoods, onto the bike path on paralleling the road you began the race on, you climb a mini-hill before being able to see Cary Grove High School. Just a few more minutes until your legs are relieved of the madness (pun intended). No finish line seems to be as sweet as this one: after 13 grueling miles through hills, you are able to find a new gear as you sprint toward that bright yellow finish sign. The weather for the race this year was near perfect, with starting temperatures just over 30 degrees and finishing temperatures in the mid-40s. 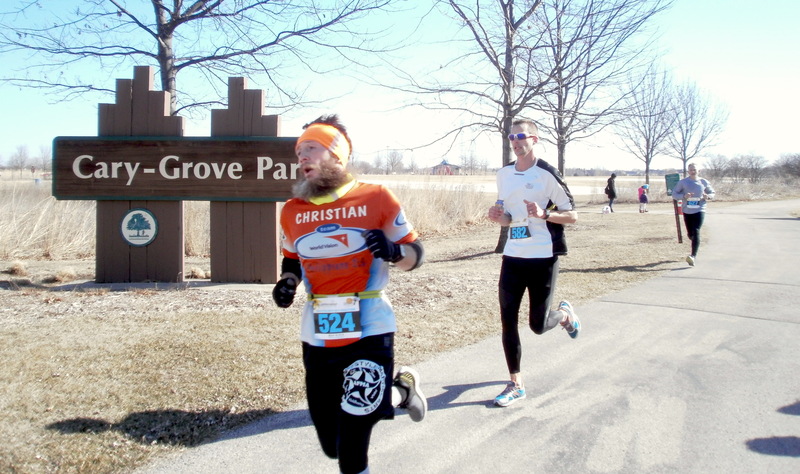 With the race taking place at Cary Grove High School, runners had access to indoor bathrooms and indoor gear check, which is always a perk for a race held in March! 978 runners earned their soft pretzel (seriously, what race gives out stadium-style pretzels at the end?!) and medal to celebrate the 40th running of the Cary March Madness ½ Marathon. For details on my personal race experience, check out jacquisjourney.com/blog on Wednesday! Congrats on your win at March Madness Half!! Is it your husband who won the overall?